Here at Hudson Dental Center, we love to see you smile. Really, we do. That’sbecause we take great pride in offering the most updated dental techniques in a relaxed, friendly atmosphere, served up by experienced and trusted dentist Dr Payal Kshatriya DDS. Your good oral health is an important part of overall health and you have our commitment to achieve it. That’s why we have our New Patient Offer. It’s a great way to discover our practice and get the exam and treatment plan you need for your health and well being. Come in for an exam, x-rays and cleaning, and our doctors will address any dental concerns with you and help you achieve the smile you deserve. All of these at the most affordable prices in or around West New York. Dentistry has advanced by leaps and bounds over the years. Gone are the procedures of old that delivered substandard results. Now, almost anything can be accomplished with the right technology and know how. We use the latest technology, and all of our dentists are thoroughly trained in the latest techniques. That, combined with our unwavering commitment to you, results in an experience that’s unlike any other in the dentistry field. You’ll immediately feel at ease, and our initial consultation will help you map out a complete dental plan that achieves superior results. Our Philosophy: We are very proud to have referrals are our #1 source of new patients. In fact, we start every day with a single goal – to provide each guest with such a unique and positive experience that they cannot wait to tell their friends and family. We want you to look forward to your next visit to the dentist, and we take the trust you are placing in us very seriously. Our success is built on long-term relationships, and we look forward to the opportunity to start one with you. 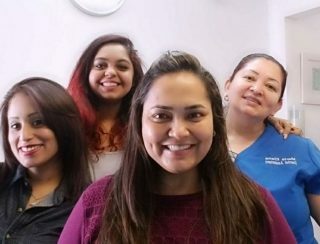 Our staff/dentists speak English, Spanish, Hindi, Gujarati. We are serving residents of West New York, Guttenberg, Union City, Weehawken, North Bergen, Fairview, Cliffside Park, Weehawken, Hoboken and surrounding areas in Hudson County. Don’t find your insurance. Click here to view all. Use Zocdoc for real time availability and instant confirmation. * Alternate Week Closed. Pls call office to confirm. Join our mailing list to get Exclusive Offers!. Copyright by Hudson Dental Center (West New York NJ) 2019. All rights reserved. Recommend us your PPO insurance plan. We are not participating with medicare or community plan at this moment.